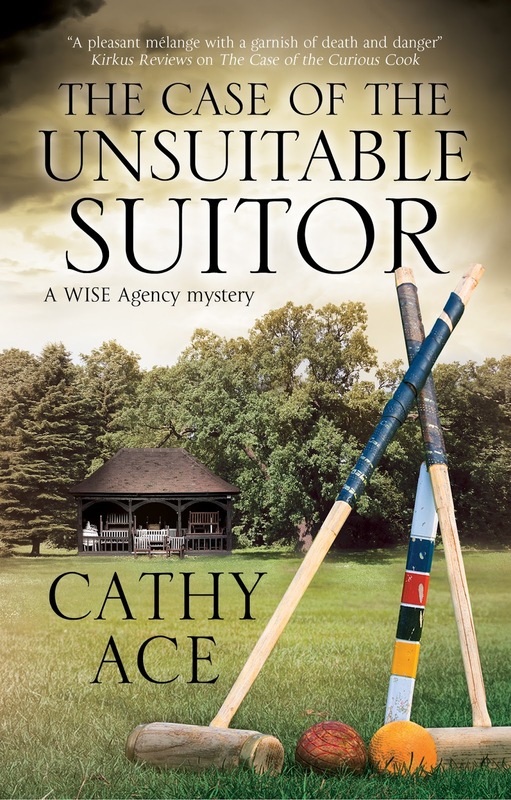 On 29th September 2017 the fourth book in the WISE Enquiries Agency Mystery series – THE CASE OF THE UNSUITABLE SUITOR – will be published in hardcover in the UK. It won’t be published in the USA and Canada until January 2018. Today you can WIN an early copy of the book. Carol had just finished in the bathroom when her phone rang in her dressing-gown pocket. With her wriggling infant son Albert clamped to her side with one arm, she answered without checking the caller’s number and was surprised to hear the voice of Tudor Evans, landlord of the Lamb and Flag pub, hissing at her. Carol’s tummy flipped. ‘Is she alright? Are you alright? 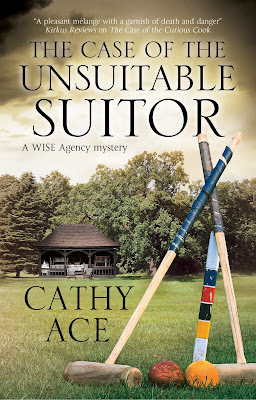 Have you phoned – what, an ambulance?’ As she spoke, Carol’s mind raced through a list of potentially catastrophic events involving Annie; it seemed endless. Tudor sounded panicked as he responded, ‘OK. But if you can get here faster, don’t hang about, just come. The side door is open.’ Then he was gone. Carol woke her husband and placed Albert on the bed so he could be cuddled and protected. He immediately poked his tiny fingers up David’s nose, which Carol noticed was helping her poor spouse come-to rather more quickly that he’d have liked. As she pulled on one of her trusty full-length, jersey-cotton dresses, she explained that she had to rush out unexpectedly. David was too befuddled to argue, or to even seek more detailed information. The grassy heart of bucolic Anwen-by-Wye should have been green, but a fortnight of surprisingly dry and sunny weather had bleached it to the color of straw. As she rushed across the cement-like turf, Carol tried to stop herself imagining horrific scenarios involving her long-time friend and now colleague, Annie Parker, but couldn’t. Carol couldn’t for the life of her work out what was going on, everything looked quite normal, except Tudor, who seemed to be vibrating. Annie was nowhere to be seen. ‘Where is she? What’s the matter?’ she asked, almost afraid to hear the answer. ‘She’s not here, not right now. But like I said, it’s about Annie.’ Tudor handed her a coffee. Carol wriggled onto a barstool and took the steaming mug. She allowed herself to relax just a little, but couldn’t help feeling a bit cross with Tudor. ‘I do. I think it’s just a matter of time. He’s got it in for her, he has.’ Tudor’s expression was grim. As Tudor finished his coffee, and poured himself another, Carol silently acknowledged to herself that she and Annie had spent hardly any time together since Albert’s arrival more than four months earlier, so she had to contemplate the idea that the woman she had thought of as her best friend for more than a decade and a half was no longer an open book to her. Not so very long ago Carol would have been the first to know about a momentous development like a new man in the life of her ultra-single friend. But now? Maybe they’d drifted apart more than just a little. At that realization, Carol felt something akin to a tiny bereavement. It wasn’t pleasant. When Tudor cleared his throat in a somewhat formal manner, she realized she had to maintain her focus. Carol slurped patiently, hoping Tudor would get to the point soon. ‘And?’ she prompted. Carol restricted herself to a quiet, ‘Uh-huh,’ realizing Tudor hadn’t finished. Carol shrugged as nonchalantly as she could. Undoubtedly, Huw Hughes is the one. I love the description "smarmy"
Tudor. Definitely unsuitable as the suitor. Or "Miss Scarlet in the conservatory with the lead pipe." Good luck with the book. Huw Hughes - can't wait to read The Case Of The Unsuitable Suitor! The Unsuitable Suitor is Huw Hughes. Looking forward to reading the book. Huw Hughes. I think his name alone should make him unsuitable! Huw Hughes seems to be the Unsuitable Suitor. I don't think it's anyone mentioned in the excerpt. Will have to read more to find out. Huw Hughes seems to be the one. I could be wrong. The unsuitable suitor has to be Huw Hughes! But, in a twist it could be Tudor. Huw Hughes is the unsuitable suitor. Thank you for the chance to win a copy!! Very cool--I'd love to read this. This excerpt points to Huw Hughes. Thanks for sharing! Huw Hughes is the unsuitable suitor. Thanks for a chance to win.